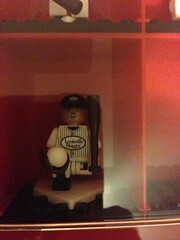 Dad and I had a hard time choosing just one mini figure for Mik's collection when we were at the Louisville Slugger Museum to see the Big Leagues, Little Bricks Exhibit. They had several that were from the National Baseball Hall of Fame series and it was tempting to get those, but in the end we decided not to since we were not at the Hall of Fame and none of them were among the players Mik particularly favored. The figure with a Louisville Slugger uniform made sense, though. Earlier this month Dad and I were driving through Louisville and noticed a billboard for a LEGO exhibit at the Louisville Slugger Museum. The Big Leagues, Little Bricks exhibit requires admission to the Lousiville Slugger Museum, which also includes the factory tour, but since we have done that twice before and did not want to add to much more time to our travel day we just saw the exhibit and the shop (had to get a new figure for Mik's mini ballplayer collection!). 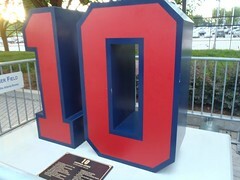 The exhibit features models of several ballparks at different scales. 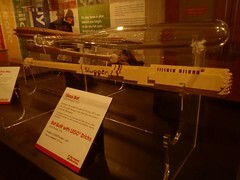 The largest model is of Wrigley Field. The other ballpark models include Miller Park and PNC Park. 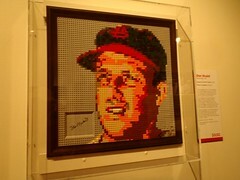 The exhibit also featured some LEGO murals. 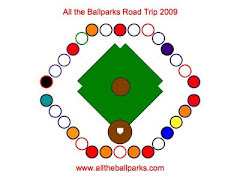 My favorite was the one called Take Me Out to the Ball Game. 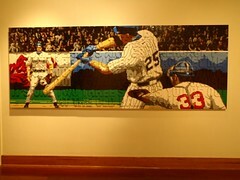 This features the lyrics raised as part of an image of a player at bat. 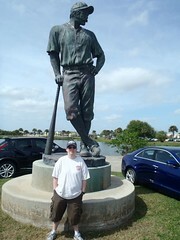 There were also murals of ballplayers. One of the more interesting parts of the exhibit was a display of bats made out of different materials including cardboard, glass, and, of course, LEGOs. 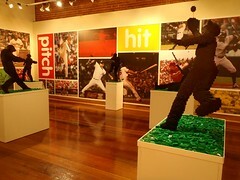 The exhibit also features LEGO models of figures doing different baseball moves such as sliding, pitching, catching, and hitting. There is also an area to build your own LEGO creations. 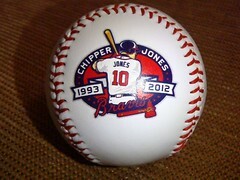 I did not even think of getting a baseball when we were at the Chipper Jones Number Retirement game because I remember them having nothing special back in 2009 when we went to Maddux's number retirement. 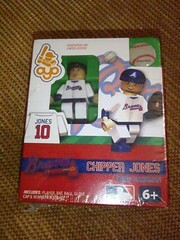 However, I guess because Chipper Jones was a much more major player for the team they did have merchandise (or they have learned from people wanting to buy stuff and there being nothing) including a baseball with an image of Chipper Jones and the years he was active/a Brave. On June 28, 2013, we went to the Dbacks @ Braves game. Mik wanted to go to the game as soon as he found out that the one time the Dbacks were in town at the new closest MLB ballpark for us (4 hours vs. when we were only 2 hours from Phoenix) was also when they were retiring Chipper Jones jersey (only one of Mik's favorite players that was never a Dback or a pitcher). 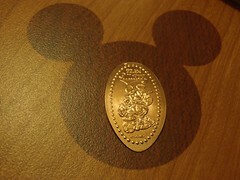 I put off getting the tickets for awhile since we did not know our flights for our Disney Cruise until late April. Once I knew we would be back in barely more than enough time to get to Atlanta for the game I found the game sold out when I went to the regular online ticket buying, but when I clicked the accessible link and went through the chat process to purchase there were still wheelchair seats with the best available being in 229. Not sure if the seats have been changed throughout the park since 2009 or it is just the 200 level, but they now have seats that can be folded and swung to the side out of the way every two or three spaces for the accessible rows. That seems to be an improvement, but sadly still no cup holders and it is annoying with the regular seats in that section having them. 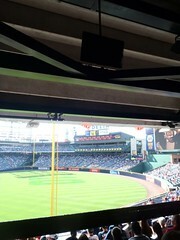 The view from our seats was not bad, but the scoreboard was partially blocked. Mostly that did not matter, but during the Chipper Jones number retiring ceremony it was annoying to not be able to see what was going on on the field due to only seeing the bottom half of the scoreboard. Since the row is raised up a good amount from the section, heads do not get in the way, but it also leads to it being mainly just an obstructed scoreboard view for the accessible row. They attempt to fix this problem with television screens, but the one in our section was not on and there was nothing they could do about it (or even say that it was broken). What is really sad is now that I look at the ballpark map, I believe we got seated in 231 and not our ticketed section of 229 and that TV worked. Mik was not sure what to have at the ballpark after referring to his post from 2009. He considered some waffle fries, but he wanted something more than that, so Dad and I walked to the stands near our seats to see what we could find for him to try. 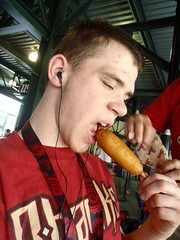 We decided to get him a corn dog, which he ended up enjoying and did not need any waffle fries in the end. There is a smashed penny machine in the ESPN Clubhouse Shop at the ESPN Wide World of Sports (where the Atlanta Braves spring train). 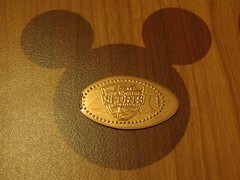 The designs in the machine include the ESPN Wide World of Sports logo, one featuring Mickey with a variety of sports gear including a baseball bat, and one featuring sports Minnie and Daisy (possibly softball related). 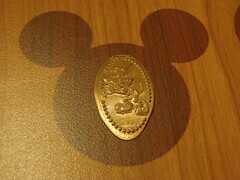 While staying at the All Star Sports hotel at Walt Disney World, we found the machine with a smashed penny featuring Mickey batting. The design is in one of the machines across from the food court near the arcade in the main lobby building. 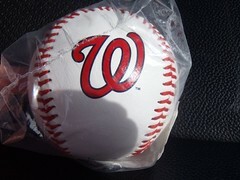 After being somewhat disappointed in the Nationals Spring Training ball option, which I probably would not have gotten if it was not my favorite team, I was really excited to find a cool one when we went to see the Nats play the Braves at Champion Stadium. 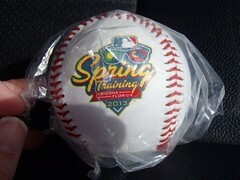 The ball features a Spring Training 2013 logo with palm trees and says Grapefruit League. 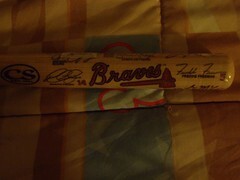 The Braves logo is kind of hidden in the logo, but as a non-Braves fan I do not mind that at all. There were quite a few food items that appealed to Mik as we walked around Champion Stadium. At first he was really into getting the brisket sandwich basket. 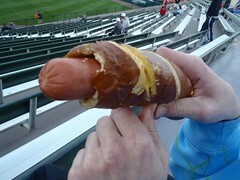 However, once he found out there was a cheese pretzel dog he had to have that, as he is a huge pretzel dog fan. He really enjoyed it, although it ended up being quite messy with the cheese oozing out as he ate it. 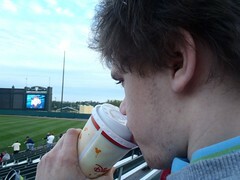 The evening was a little windy and cool, so he also was glad that Dad found hot chocolate for him to warm up with. He did not say what he thought of it, but it must have been at least okay or he was really cold because he downed it pretty fast (Dad taste tested to check it was not too hot before giving it to Mik). 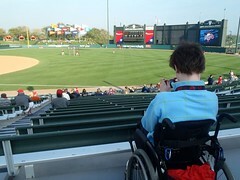 Tonight we went to see the Nationals play the Braves at Champion Stadium located at the ESPN Wide World of Sports Complex at Walt Disney World. We were staying at Disney World, so we could have taken the bus transportation they offer from resorts to the ESPN Wide World of Sports, but Mik does not particularly like riding on buses and there can end up being a bit of waiting for them at times. 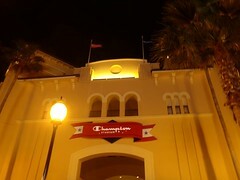 Thus, we drove from the resort and parked at the complex, which is at least free, although you can pay $20 for valet. The lanes are clearly marked for disabled parking as you enter the parking area, however, there are not that many rows of actual handicap spots and like our Disneyland experience they always seem to be full and it is just a close to park/tram section of the parking lot. Since we need the handicap space to be able to unload Mik, we just parked between two spots like we normally do when handicap spots are full. For the game we sat in section 104 along the first base foul line. The wheelchair rows are nicely marked on the ground for each spot. The ushers are good about bringing out chairs as needed. They only allow you to buy one companion ticket and oddly our ticket for the row in front was for a space on the opposite end of the row and not right in front like we thought because the bleacher row starts with 1 on the right and the wheelchair row behind it starts with 1 on the left. It did not end up mattering, though, as they had no problem bringing us two chairs and sitting together. It is nice they enforce the one companion spot for the wheelchair rows while also being flexible to allow you to sit together on gameday when it is not crowded. Overall, though, Mik quickly rated the accessibility low. Mainly he did not like that the handicap section was not raised more than the typical row above the regular seating. This meant that his view was easily blocked when people sat in that row. Of course, he also did not like there being no cup holders, but that is something lacking at even some major league regular stadiums, especially when you sit in the bleacher sections. Most annoying to him, though, was when there was a bunch of fireworks after the National Anthem. He was totally ready for potential ones to go with rockets red glare, but he was pissed when there was a mini show of mostly really noisy fireworks after the anthem. Between that and it being a somewhat windy and chilly evening, his opinion was tainted a little more than normal, so I think his low rating is not as low as he made it seem, although it really does make a big positive difference in enjoyment when the wheelchair seating at the top of a section is raised up more. 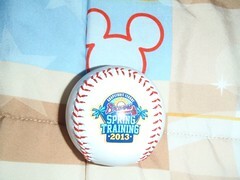 I was kind of disappointed that they do not really have an unique Grapefruit League logo and the Spring Training 2013 logo is for both Arizona and Florida, but I still decided to get the baseball to for my collection. Certainly better than the plain white ones they had with the Curly W. The Strasburg and Harper ones were more interesting, but I am not much into collecting the player specific baseballs. 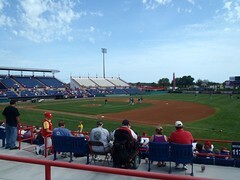 Today Dad and I went to see the Miami Marlins play the Washington Nationals at the Nationals spring training home, Space Coast Stadium. The first stop was the Team Shop to get Dad a Nats shirt, so he did not keep wearing his Cubs shirt to the games. 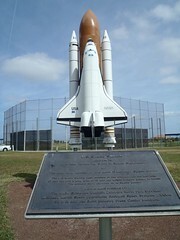 Also, got some pics outside with the Casey at Bat and space shuttle statues, although the car salesman kind of made it not worth going near the Casey at Bat one. For the game we sat in the bleachers (219). 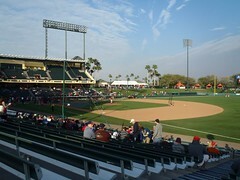 The view of the field was good and the bleachers are not bad since they do have backs. 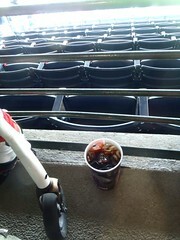 Dad found the $10 deal for a hot dog, fries, and souvenir cup of soda pretty good. I was disappointed to find them have stands advertising cheese and pizza pretzel only to go up to order and find out they only had plain ones this season. How hard is it to cover up the options no longer available? The game itself was nothing special, as spring training usually is not. Mik actually almost wished he was going when this morning he heard Dan Haren was starting, as he liked him when he played for the Dbacks, but he never has been into spring training ball even when the Dbacks used to play down in Tucson. We actually only ended up staying through three innings for the order to go around once. It just was not much fun sitting in the hot sun (they have pretty much no shaded seating in the whole ballpark) and no reason to stay when we gave up scoring spring training games years ago since it gets annoying with all the lineup changes. Overall fun to see the Nats play some baseball and looking forward to them playing at the Braves Friday, but still anxiously awaiting some real baseball come April and seeing if they can be good again.